Who better than Shane England (a.k.a. the Big Kahuna), a superstar on the Monster Jam circuit, to showcase the tire-saving powers of Slime tire sealants? Check out our latest video to see the Big Kahuna in action and find out why Slime can help you be flat-free for two years! Slime: How did the nickname Big Kahuna come about? Shane England: I grew up in northeast Texas loving to surf; Kahuna is a nickname I received years ago. In addition, I’ve always built crazy lifted vehicles and would show and sell them. I’ve had 60 vehicles since I was 15 years old. 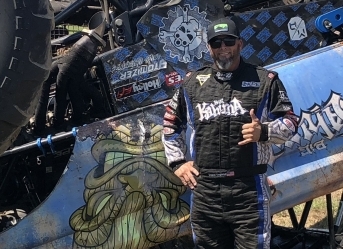 When I started my racing business, the name Kahuna Motorsports began. Then when I got into monster truck competitions, ideally the only fitting truck name would be Big Kahuna. SE: I started helping an acquaintance who owned a team back in 2006. I worked for him on my days off of work for six years to learn all the ins and outs of the business side. Then in 2013, the Big Kahuna made its debut in Monster Jam. What is your signature style or move in competitions? SE: I’m known as a freestyle driver. My signature move is the consecutive back flip. I have the double down but have been trying to perfect the triple. What does it mean to you to have your son Tristan (EarthShaker) following in your footsteps? Any fun mishap stories from competitions or other times on or off the road? SE: Every week is fun running the truck. No matter how much damage or how many issues I have, if I didn’t love it, I wouldn’t do it. Passion is what drives someone to compete at this level. Tell us about the day of the Slime shoot. We understand you actually got a flat and used the Slime product to keep filming! SE: During the last couple of weeks prior to the shoot, I had a few small leaks in one of my tires. I would fill the tire with air prior to a race, and by the next morning the tire would be flat. We put 2.5 gallons of Slime into the tire the day before the shoot and then set the air pressure, and I’m happy to say that the tire is still holding pressure two weeks later! What are some of your favorite hobbies or interests outside of Monster Jam? SE: My number one hobby is building custom vehicles. I also mountain bike and go rock crawling/overlanding in my FJ Cruiser. I raise black Angus cattle on our ranch in Texas. I have a few tractors and a lot of equipment to maintain the property, and Slime is definitely a product I use on a regular basis.